Saturn large boats are great for fire and rescue units. HomeBoatsToGo - Blog About Inflatable Boats, Inflatable Rafts, Inflatable Kayaks And More...Saturn Inflatable Boats Are Used for Floodwater Rescue by many Emergency Departments across the US. Saturn Inflatable Boats Are Used for Floodwater Rescue by many Emergency Departments across the US. 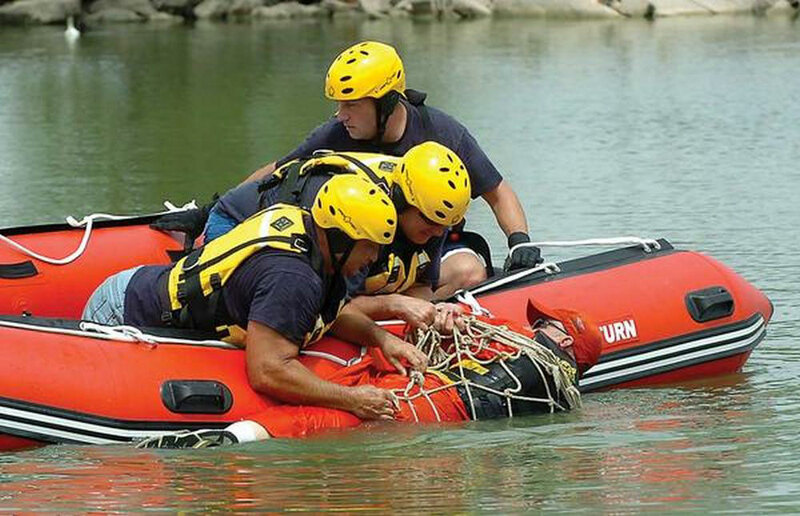 Many firefighters spend weeks in the water perfecting their flood rescue techniques like the Enid Fire Department. After major flooding in May, the departments Training Officer said the department needed a new Saturn inflatable rescue boat to perform their duties. This is because firefighters were called to rescue at least five motorists from floodwaters during the spring storms. Baker was quoted as being currently "training" using several methods of flood water rescue to attend to victims in future floods. As the weeks commenced the firefighters partook in many training exercises to hone in their skills. In one exercise firefighters used a Saturn inflatable raft and net to roll simulated victims from the water and into the boat. Assistant Fire Marshal Todd Hays says that rescue efforts are "putting our rescuers' lives at risk" and specifically referred to the last season when motorists were driving around barricades and becoming stranded in floodwaters. He says "we put our lives at risk as well as the victim." There are now new laws in effect now that prevent drivers from passing government barricades of closed roads. But just in case motorists do, and end up stranded as a result, the firefighter department in Enid Oklahoma has purchased a new Saturn Kaboat for rescue efforts.